If we were having coffee, I’d tell you that I’m sad to say that we had to finally return the giant stack of comics to the library. Holly was amazing and read most of them, but if you feel like you haven’t seen many of them yet here on the blog, don’t worry! She collected some pictures and is ready to go to talk about several more. Speaking of, did you catch Holly’s post on Persepolis the other day? If we were having coffee, I would say I need to apologize. I said before that we don’t have a local comic store where we live – and that is not true. It turns out, we kind of do. There is a store that sells comics here – trade paperbacks and collections and graphic novels. They don’t have the weekly comics stand. The logistics of getting those here, in time, and making any money on them… I get it. But hey, we’re loving browsing the shelves now. Got a gem that I’m looking forward to reading. I mean, holding up the iPad can be awkward too with the Geek Baby, but would be easier to do one-handed than the books. And I’ve found there are a number of comics we read that now have new collected editions – especially the finale to Hawkeye. Looking forward to that! And Marvel seems to already be booting up their new titles… even before Secret Wars ends. Not sure how that works. But I’m waiting for a collected edition for Secret Wars – and probably just Marvel Unlimited for all the related comics that sounded interesting! Then I’m thinking I’m good with Marvel for a while, let Hickman end the universe. Leave the new reboot for new readers. If we were having coffee, I’d mention that I haven’t done too much of character design on Instagram this week, but I did some character sketches, including some you may know… And I made a couple of joke comics. Not that those are my actual goal, but for single images, that’s a good way to go! Check them out, and let me know what you think! Still thirsty? Check out the Weekend Coffee Share linkup over on Part-Time Monster! And as she mentions, we’ll be hosting the Feminist Friday discussion right here next Friday! Gaimain’s Sandman series is built as much in image as in word, the artistic renderings of characters and places adding texture and depth to the story–as is the nature of a good comic series. And the material is what Gaiman and the artists excel at: constructing fantastical worlds. Fiddler’s Green is both a place and a person (you’ll find him as Gilbert on my list of favorite Sandman characters). As a place in the Dreaming, Fiddler’s Green recalls the maritime folklore of a place for sailors, a beautiful, pastoral resting place for those who’ve sailed the seas. As a book lover, there are few things in the world of the Dreaming that have more pull for me than Dream’s library. Inside the library are all of the books that have been dreamed but never written, and they are cared for by Lucien. I’d love to pick a cozy chair and just read and read and read. 3. World’s End: A Free House. In the frame story for World’s End, travelers are drawn to a mysterious inn and, like Chaucer’s Canterbury travelers, they begin to tell tales. The inn itself is a sheltering place during reality storms–this one ushered in by the death of one of the Endless. The array of people and the old-world feel make this one of my favorite spots in the series. In The Doll’s House, the second Sandman collection, we spend much of our time in a boarding house with an eclectic set of inhabitants: the dream vortex Rose Walker, Gilbert (aka Fiddler’s Green), the Havisham-like Chantal and Zelda, Hal (who is both the landlord and a nightclub performer), and Barbie and Ken. The boarding house works as a way to bring together a diverse and fascinating set of characters. We don’t actually see much of Faerie, but what we do see is beautiful. It’s largely based on A Midsummer Night’s Dream, with Titania as its queen and gift-giving as its currency. Like the best of faeries, the realm and its inhabitants are magnetic and dangerous. In 1389, Dream met a man named Hob Gadling who swore never to die . The White Horse became their annual meeting place. We see the place change, take a few new names, and eventually deteriorate, reminding us of the breadth of the story and the longevity of the enigmatic Hob. Dream’s throne room is beautiful—and so is the rest of his home. It’s guarded by a gryphon, a wyvern, and a hippogriff, and it is the heart of the Dreaming. Like its owner, the castle is but an aspect of dreams, if a beautiful one. Death is perhaps the most human of the Endless, and though we don’t see her domain, we do see her apartment. Yes, Death has an apartment. There’s a floppy hat collection, goldfish named Slim and Wadsworth, and a big comfy couch. It sounds a lot like a place I’d want to have coffee. Barbie is one of the residents of the Boarding House. Later in the Sandman run, in the collection A Game of You, the rich fantasy world that Barbie creates in her dreaming takes front and center. Barbie’s dream world is a fantasy land threatened by the villainous Cuckoo and inhabited by some of the most interesting characters in the series. Soft places are spots where the boundary of dreaming and waking are malleable. They are places where Marco Polo can encounter inhabitants of the Dreaming, where historical figures meet dream figures and nothing is terribly certain. 11. The House of Mystery. The House of Mystery is both in the Dreaming and the waking world, somewhere just north of Louisville. The architecture of the house and its interior change from time to time. It’s the home of Cain, and it sits close-by The House of Secrets, the home of his brother Abel. 12. The House of Secrets. The House of Secrets is the domain of Abel, and like his brother’s home, it exists both in the Dreaming and the waking worlds. The house moved itself to the other end of the graveyard where The House of Mystery sits, and the two houses are mirror images of one another. This is Destiny’s realm, and we’re not there often—but when we are, it’s phenomenal. Blind Destiny walks the labyrinthine paths of the garden continually, and there seems to be no end to its paths. The Thursday 13 is a meme that Part Time Monster does often. I enjoy writing them but don’t have the time to do them every week. 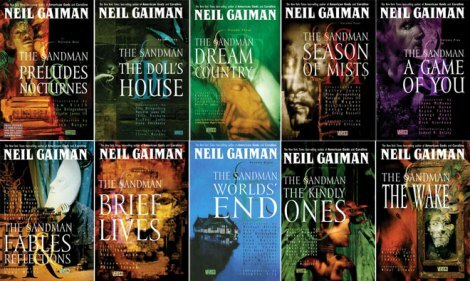 When I agreed to blog about Neil Gaiman’s Sandman series here back in February, I decided to sit down and write a few of these. Here are my 13 favorite Sandman locations. You can also check out my 13 favorite characters and my favorite stories. 2. The Necropolis Litharge — The ultimate mortuary. An entire city on another plane devoted to disposing of its clients’ remains in a dignified manner according to their last wishes. The citizens are apprenticed from a young age and those who don’t develop the skills to qualify for citizenship are sent out across the worlds to become great morticians. Citizens sleep on stone slabs, are fed by offerings from clients, and are clothed in garments left behind by the deceased. Denizens of Litharge performing an air burial. Image via Comixology.com. 3. Faerie — Just Faerie. It isn’t featured in many issues, but I love the artwork and the denizens. It’s connected to various other planes by portal stones which can only be activated with the consent of the King and Queen of Faerie. 4. Fiddler’s Green, aka Gilbert — Described as the heart of the Dreaming. Originally, the place where sailors who die at sea go (though possibly much older). A lush, green place populated by animals where music is forever playing. Incarnates itself as Gilbert and has an adventure in the waking world early in the series. 6. Destiny’s Garden — The bulk of Destiny’s realm is garden with ever-branching paths which everyone walks. Every decision everyone ever makes represents a branch in the path. The centers of all the labyrinths that ever existed or ever will intersect in the Destiny’s Garden. 7. The Earth of Boss Smiley — Featured in a stand-alone story in World’s End. Boss Smiley is the prince of this Earth, and functions as both God and the Devil. He’s drawn as a man in a suit with a huge smiley-face head. He has a Heaven which people go to after they die and sing his praises. The Threshold. Image via Comicvine.com. 8. The Threshold, the Fortress of Desire — Desire’s realm is a Fortress surrounded by empty mist. The fortress is a colossal statue of Desire himself/herself with accurate internal anatomy. It’s described as having eardrums the size of ballrooms. The circulatory system is corridors, and you could wander them your whole life without once re-tracing your path. Naturally, Desire lives in the heart. 9. The Library of Dream — An important part of the Dreaming. Contains all the books that were never written. That’s quite enough to warrant a place on this list. 10. The World’s End Inn — An inn that belongs to no world, where travelers take refuge when something so cosmically huge happens that it sends ripples across time and through the various worlds which disrupt the order of things. Having taken refuge, the travelers then tell stories to pay for their drinks. 11. The Land — A dream-skerry. Basically, a self-contained dreamworld represented as an island just off the Nighwtward Coast of the Dreaming. Setting for much of A Game of You. Dream functions as its creator deity. 12. The Soft Places — Places where the Dreaming touches the waking world. The center of the Gobi desert is one such place. Mortals can get lost here and wander for centuries without aging. Dream comes to the Soft Places to think from time to time. He encounters Marco Polo here at a pivotal moment early in the series, and an exiled Chinese civil servant in one of the final issues. 13. The Realm of Despair — A realm of mist, with rats scurrying around under foot, hung with endless mirrors. The Realm of Despair is the space behind every mirror. Despair of the Endless peers into the mirrors and whispers to people in moments where they are trying to decide whether to recover from some catastrophe, to lose all hope, or to take their own lives. Want to join us for #SummeroOfSandman? Here’s how: Write a blog post about Sandman between now and Aug. 1. Long or short, any format. Share your link with us on a Sandman thread here or on Twitter using the hashtag #SummerOfSandman. It’s that easy.